Skill-level: Intermediate— cabling, lace stitches, and sock construction. Gauge: 32 stitches and 36 rounds in stockinette stitch across 4 inches or 10cm. Sizing: Small (Medium, Large, Extra-large) sizes measure approximately 7(8,9,10) inches or 17.75(20.3, 22.85, 25.5) cm in circumference. Leg height, ankle depth, and foot length are all adjustable to fit and preference. Note: This sock features 4-stitch bobbles, which can be replaced by beads or simple knit stitches, if desired. 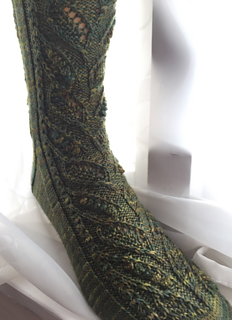 One reason for the high yardage is that the sample socks worked the full bobbles for the entire length of the sock. If you work with beads or knit stitches, less yardage will be sufficient. All other stitches are defined in the chart key, and include yarn overs, bobbles, and multiple cable stitches.